The Paschal service is special; there is no doubt about that. It is always distressing that this service can pass by in a single moment, as quick as lightning. The Paschal service appears on our life’s horizons quickly, illuminating our mind and feelings, and then disappears from sight. Then once again we await Pascha. We await it all year round, and all Great Lent. At the end of the eighties I had not yet been Baptized, and I was just beginning to turn to faith and go to church. An acquaintance of mine from the institute was a believer who attended the Church of the Resurrection Slovusheye by Uspensky Vrazhek [in Moscow]. It was under her guidance that I took my first steps towards the Church. I remember my first Pascha. Nearly all beginning Christians find church service to be a serious labor. This service was very long and, due to my ignorance, mostly incomprehensible. With great difficulty I managed to stand until the end of the Paschal Matins, and then it “turned out” that there was still the Liturgy ahead. It was a real trial! During the Paschal liturgy, as is customary in many old churches, they read the Gospel in several languages, none of which I knew at all. I stood there trying very hard to penetrate the meaning of what was going on. It is surprising that, having neither experience of prayer nor understanding of the church service, I was profoundly and deeply impressed. One could say that this was just a new “cultural discovery” for me. But, however new a cultural event may be, it is still a run of the mill thing for a secular man. One cannot experience one and the same work of art all one’s life; one way or another the impression pales beside later cultural developments. The impression from my first nocturnal Paschal service has stayed with me forever (although, to be honest, I must confess that I stepped into the yard a few times to rest a little). It is so bright that if I close my eyes I can still see Metropolitan Pitirim standing on the cathedra and the distinguished priests reading the Gospel in various languages. 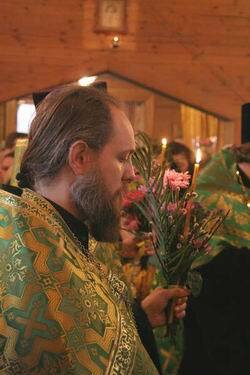 It seems to me that one’s first impression from a Paschal or any other festal service is very important for one who has just started going to church, because it provides a supply of spiritual energy for many years to come. 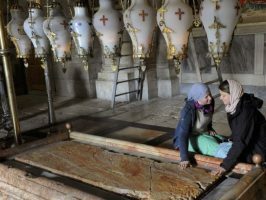 It is human nature to grow used to things, and this is why it becomes ever more difficult to preserve the same heartfelt, prayerful feeling during an ordinary everyday or Sunday service as one had had at the beginning of one’s conversion. However, we have only ourselves to blame if what goes on in church becomes routine: we are unable constantly to urge ourselves to concentrate and pray warmly. If a person has ever had a lofty spiritual feeling during a church service, this recollection helps him to return to the soul’s needs during his day-to-day routine. In the course of time I started attending another church, the Church of All Saints in Krasnoe Selo. I was a regular parishioner for about five years, and it was mainly there that I acquired my experience of the spiritual life. I went to this very church for all the Paschal services. Characteristic of the services there was, first of all, that they were very long. The Paschal Liturgy ended toward the morning. We went home around seven in the morning. It seemed to me then that it could only be this way; but, naturally, I had to get used to it, to train myself, and this was no easy mater, because of my unchurched past. I still live on the spiritual energy supply I received then. The service was done entirely according to the Typikon. The canon was sung in this way: the canon verses were repeated several times. Some were skeptical: why repeat the same thing over and over again, during the service and every day? The service according to the Typikon shows why the repeating elements of the service are necessary. The repetitions make the divine truths, the content of the divine service, remain firmly in the mind of the worshipper, captivating his mind and feelings, becoming a part of his being. Then the content of the service becomes understandable, inherently your own, something not imposed on you, but innate. For a beginning Christian, if he is young and healthy, one simply needs to try to humble oneself, to bear the pain in one’s feet, the fatigue. In time it will all become natural and easy. It goes without saying that it is more difficult for a more mature or elderly person. These church services were, for me then, not only filled with spiritual content, but were also educating me. You can simply stand for an hour or two during a normal service, but when it lasts for three, four hours and more, you are already no longer waiting for it to end. Like it or not, you get involved in what is going on. 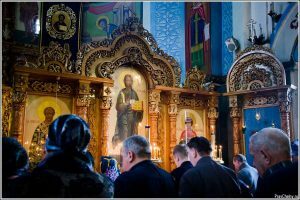 Although a simple worshipping parishioner does not normally sing or perform anything, if he pays close attention to the service he becomes a participant. This is one of the main tasks of a parishioner during the Liturgy, that is, Divine service in common. The Paschal service is special; there is no doubt about that. It is always distressing that this service can pass by in a single moment, as quick as lightning. The Paschal service appears on our life’s horizons quickly, illuminating our mind and feelings, and then disappears from sight. Then once again we await Pascha. We await it all year round, and all Great Lent. All the waiting is condensed in the moment they start singing the stichera in the altar: “Angels in the heavens, O Christ our Savior, praise They Resurrection with hymns…” The Paschal service starts, and it will be over in just a few hours, and then once again we wait for it to happen again. 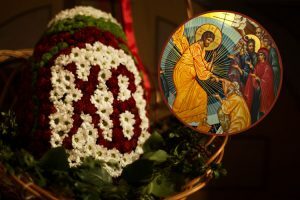 May God grant that this very waiting be the most important one for us, and not the tormented expectation of something earthly and transitory, but rather the expectation of Christ’s Pascha as a clear witness of that for which we all strive: the Kingdom of Heaven.